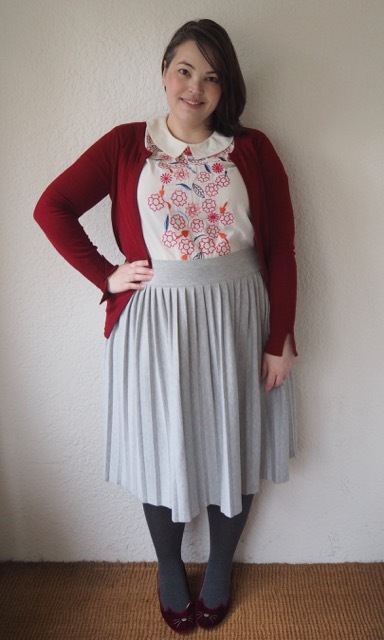 Sorry for the long absence – it’s been a busy few weeks, and so dark in the mornings and evenings that I haven’t been happy enough with any of the outfit shots that I’ve taken to want to post them on the blog. 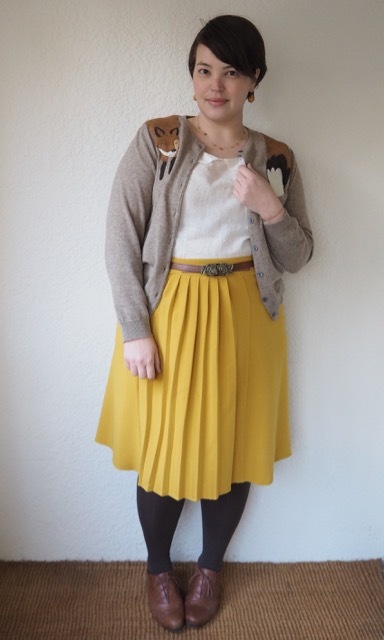 I’ve been spending a lot of my free time sewing (it’s addictive!) 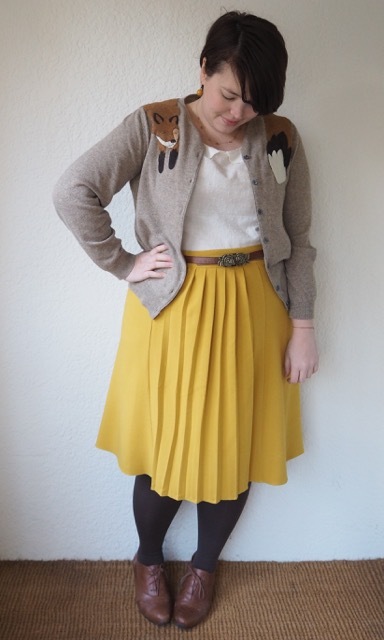 so I’ve got lots of homemade pieces to show you, but today I’m wearing some old favourites from my wardrobe. 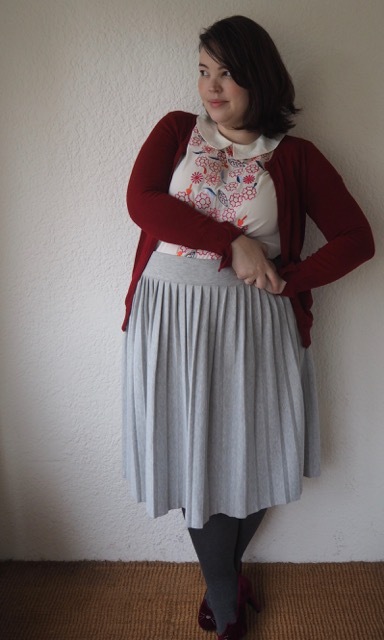 I hope you guys don’t mind me wearing and re-wearing the same things over and over again. 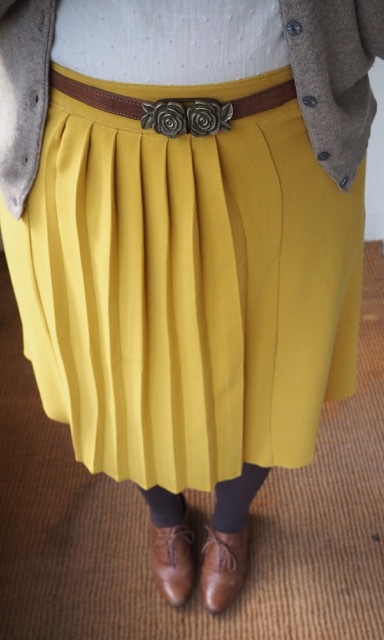 It doesn’t make for the most exciting fashion blog (and I know how annoying it is when you fall in love with something only to find out it’s six years old and you can’t buy one for yourself) but I guess it’s called an OOTD (outfit of the day) not BNOOTD (brand-new, etc etc). Anyhoo. 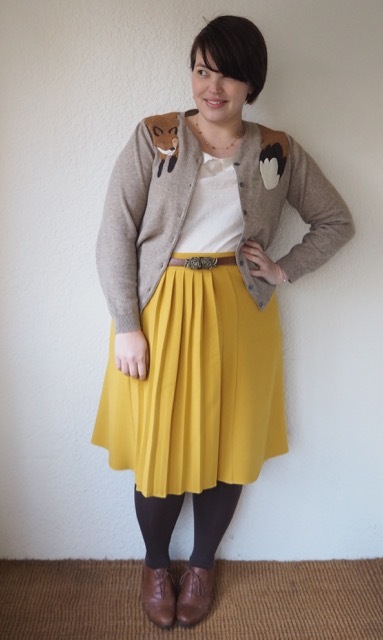 Every winter I go on the hunt for a pair of knitted-style tights that will fit. 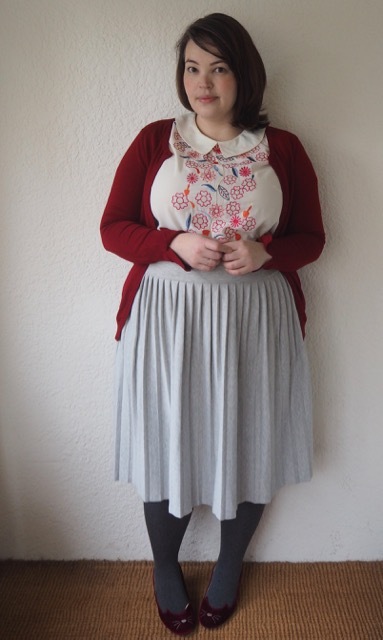 There don’t seem to be many plus-size brands who do them – and when they do they’re usually plain black. I had some luck a couple of years ago with (of all things!) Big W, but I think it was a fluke production, because I went back and bought heaps more pairs only to discover that were smaller & didn’t fit properly. Marks & Spencer did some in their ‘heat-tech’ range, but they got holey within a week, and they don’t look like they’re available anymore anyway. Meanwhile, last weekend I signed up for my first yoga class in, umn, far too long. 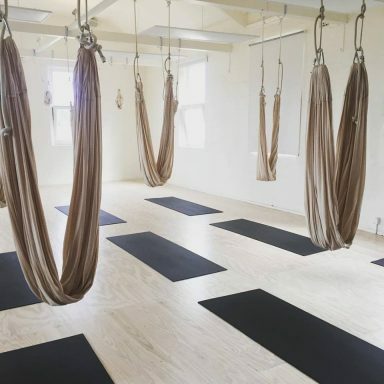 And not just any yoga: AERIAL yoga! Yoga teacher, and body positivity activist, Sarah Harry, runs a resource called Fat Yoga to help create inclusive and supportive classes for plus-size people to practice yoga without fear of judgement. 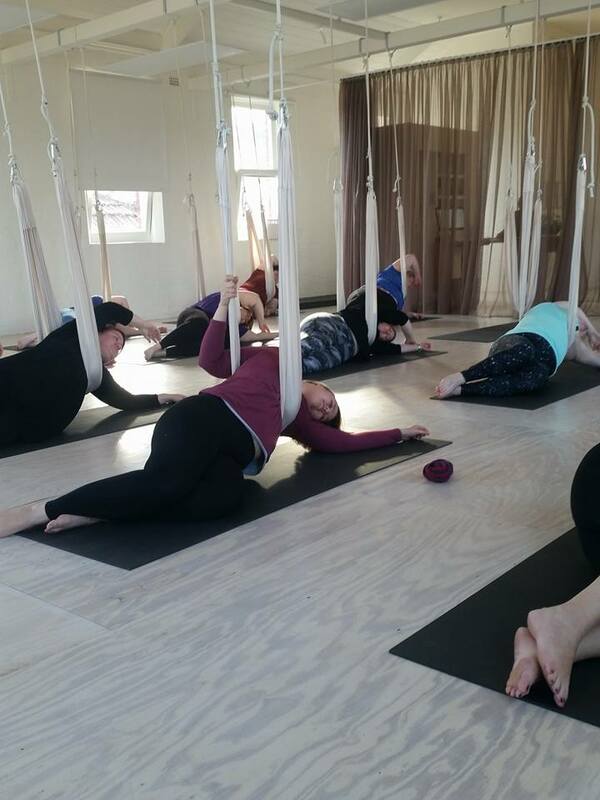 Over the long weekend Sarah hosted a special aerial yoga class at Body Flow Yoga Studio, which is a lovely space not too far from me. It looked like fun, and something new, so I signed up to give it a try. 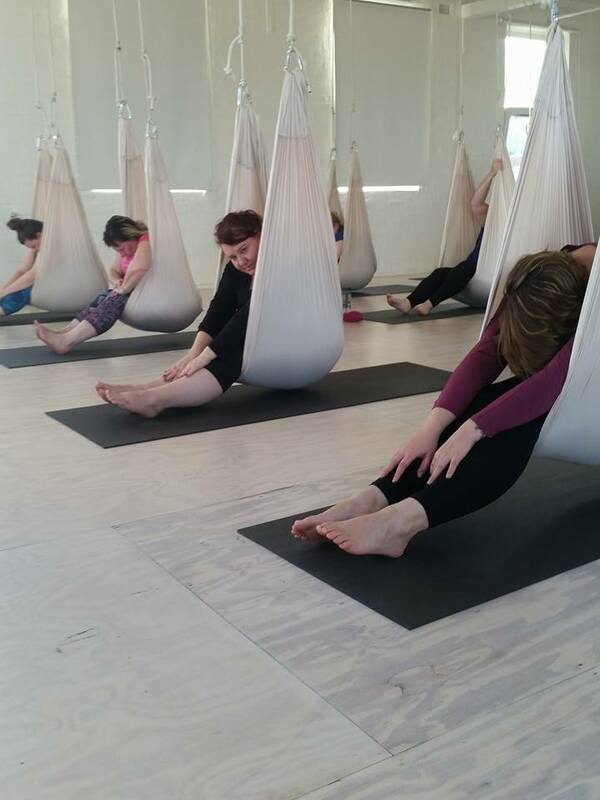 The ‘silks’ are basically little hammocks suspended from the roof and they give the yoga practice a lovely liquidity. I found them a little uncomfortable in some of the poses – when your body weight is resting on the strip there’s a fair bit of pressure there, but some of the poses were fully suspended in a kind of cocoon, and that was nothing short of divine. (I’ve pinched a couple of photos from the Fat Yoga Class facebook page to give you a bit of an idea). I had a ball, and I’ve already booked a second class; just a regular beginners class, not a body-positive one (though I’ll be joining another member from Sarah’s Fat Yoga group). If you’ve got the opportunity to give it a try, I’d definitely recommend it! 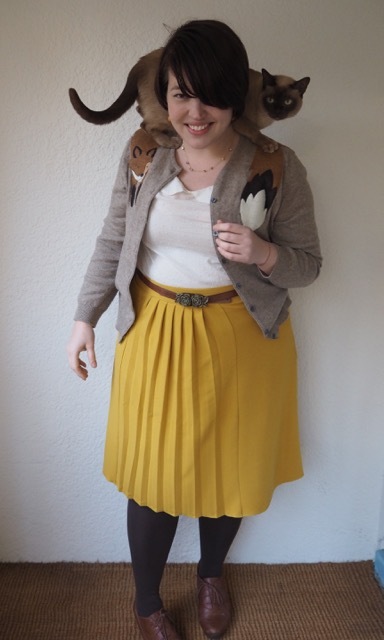 I’ve had my eye on the fox-stole cardigans at Dandyrions for years now, but when I saw her new-and-improved style I gave up any attempt at resisting temptation pretty much immediately. They remind me fondly of a sweater that I was wearing way back when Frocks and Frou Frou was in its infancy, though the Dandyrions fox is much less carnivorous-looking with his sweet little face and whuffly nose. The fox-stole cardigans at Dandyrions are actually generic store bought pieces from H&M with Lisa’s lovely embroidered felt appliques hand-sewn onto them, but if you don’t see the size or colour combo that you’re after (and Lisa can’t source it for you) you can actually buy the appliques by themselves and attach it to your own cardigan or top. 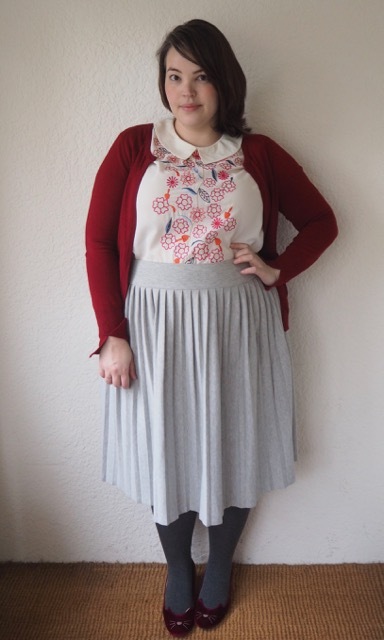 I’m still working on a fairly tight living budget post-redundancy, so after a bit of deliberation I decided to do the Sensible Thing, and rather than having Lisa from Dandyrions source a cardigan for me I went the cheaper option and decided to attach the applique myself to one of my plain Woolovers cardigans. 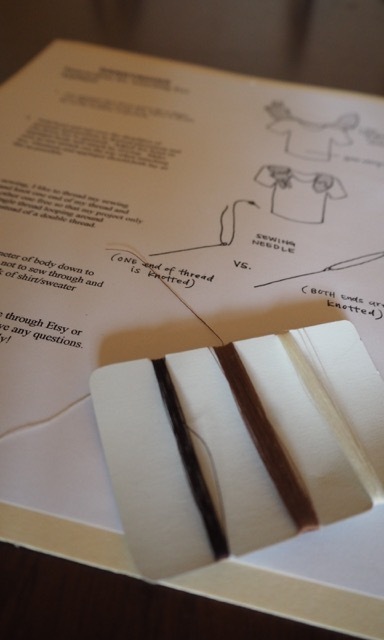 The applique arrived quickly, complete with comprehensive sewing instructions, and even thread to match the three key colour elements in the felt. 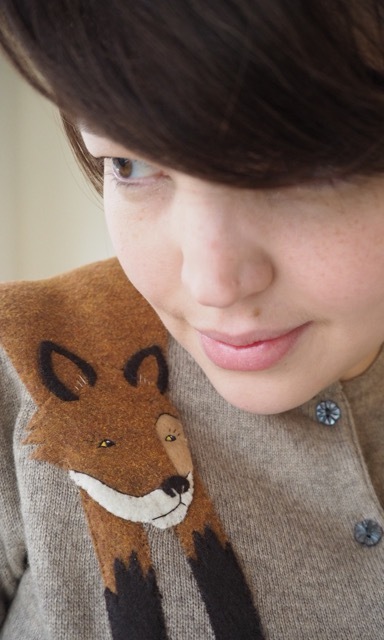 It was a simple task to hand-stitch the little foxy fellow onto my cardigan. The head and front paws come separately from the body so that you can arrange it to best suit the neckline of whatever top you want to use. I positioned, pinned, and stitched all in one night while sitting in front of the telly with my boyfriend, and even if you have the most rudimentary sewing skills this should be a fairly straightforward job – you just have to ensure you don’t stretch the cardigan/top out as you sew to ensure the applique doesn’t buckle (or you can just get Lisa to do it for you!). The little foxy friend wraps all the way around your shoulders just like an actual stole, but with considerably less Cruella Deville. 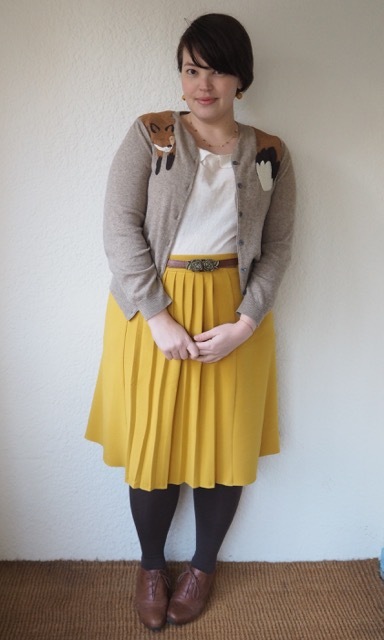 I teamed it with my mustard skirt, tights, and collared blouse for that kind of Escape To The Country vibe. I think the local wildlife approved….